Home B Basal Cell Carcinoma: What Is a Basal Cell Carcinoma? 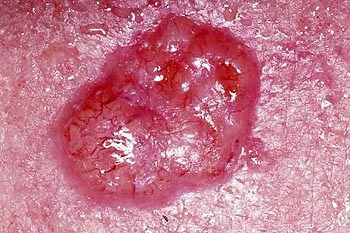 Basal cell carcinoma is the most common type of skin cancer. It rarely metastasizes or kills, but it is still considered malignant because it can cause significant destruction and disfigurement invading surrounding tissues. Statistically, approximately 3 out of 10 Caucasians develop a basal cell cancer within their lifetime. In 80 percent of all cases, basal cell cancers are found on the head and neck. There appears to be an increase in the incidence of basal cell cancer of the trunk in recent years.